Notes: Sarah is not only an outstanding associate here at AAF but she has been a student at the studio for more than 30 years. Her style is eclectic, fun, and creative...seeking unusual and interesting fabrics for that perfect project. 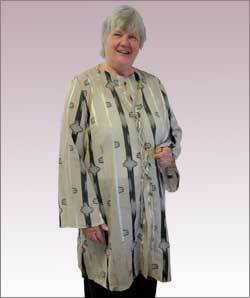 Sarah traced the tunic pattern, adjusting it according to her measurements. 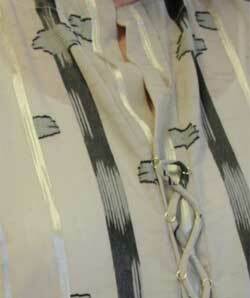 The front closure is a tie that is woven through a series of small rings that she hand sewed to the band. Notice how perfectly she matched the fabric.